← Some Video Game News! This is it! 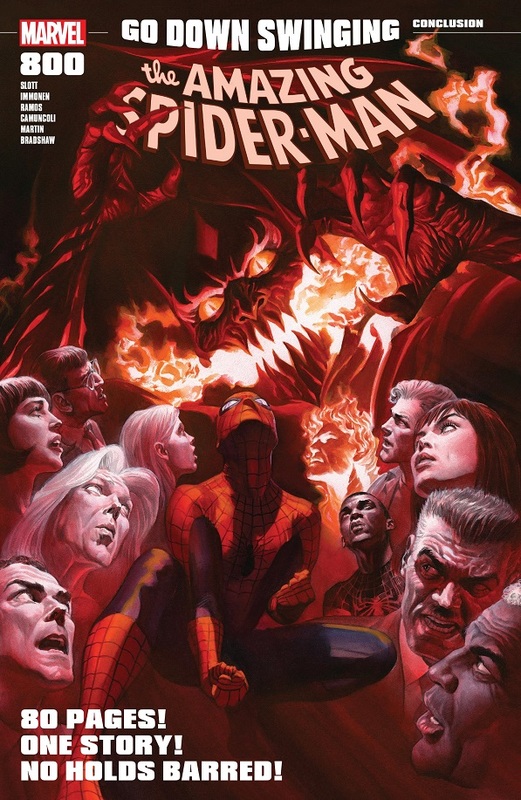 Dan Slott’s grand finale after a decade of writing Amazing Spider-Man! And it’s a big, 75-page story to wrap up everything, mostly! I have deeply enjoyed Dan Slott’s Spider-Man all these years (Superior Spider-Man being a creative highpoint), but I’m ready for something new — both for Amazing Spider-Man and Slott. I’m looking forward to his Iron Man and Fantastic Four comics. Normally I give a full synopsis of a comic, but there’s just so much stuff in this issue! I think I’ll try and cram it all down. This is still going to be a really long entry, because I also have a lot to say about the issue, so apologies in advance. Spider-Man goes after the Red Goblin, prompting the Goblin to go after Mary Jane and Aunt May. Venom helps to save MJ and gives Peter the Venom symbiote to help in the fight. 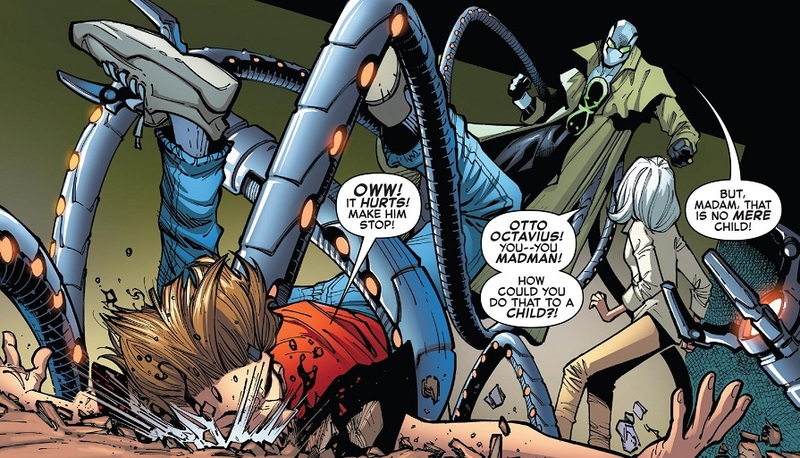 Doctor Octopus helps to save Aunt May. Norman attends a business meeting with Liz Allen to get her company, but Harry launches an ambush. Normie then turns on his grandfather when the Red Goblin throws Liz out of a window. Spider-Man faces off against the Red Goblin, who reveals that he let all of Spidey’s loved ones and allies live because he planted Carnage slivers in them, and he snaps his fingers to send those slivers into their brains — but Flash Thompson shows up and reveals he used the last of his Anti-Venom juice to get rid of the slivers (and learn Peter’s secret ID). Red Goblin kills Flash Thompson and Peter is mad. They face off in Times Square and Peter realizes that Norman’s weakness is his ego, so he convinces Norman to ditch Carnage so that the symbiote doesn’t get the credit for killing Spider-Man. Peter ditches the Venom symbiote, too. The two of them duke it out and Spidey wins, then he burns the Carnage symbiote before it can re-bond with Norman — which has the added effect of burning Norman’s brain into cuckoo crazy land. 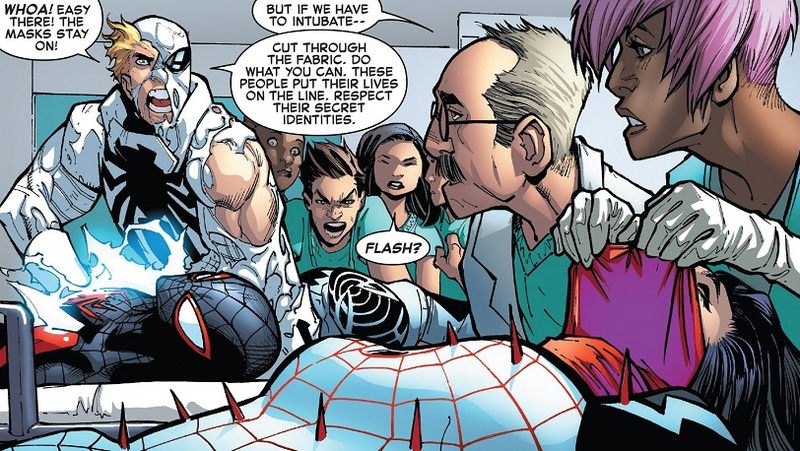 J. Jonah Jameson shows up to shoot Norman dead once and for all, but Spidey stops him by taking the bullet for Norman and teaching Jonah to be better. In the end, Norman is locked up in an asylum, all crazy and nonsensical. Flash gets a nice funeral, with Peter saying a few words. Normie isn’t fully cured. And Doctor Octopus, under his new, studlier identity, goes to work for Horizon University. Hands down, this was a pretty awesome and gnarly fight. We jump from one battle to the next, with an all-star art team, so the energy never slows down. The issue is full of nice character moments with pretty much all of the main characters, and Spider-Man is in fine form. This issue has pretty much everything you could want from a big Spider-Man finale. The action is epic, the dialogue is sound, the use of characters is well-handled. The Red Goblin is used to great effect as a final boss, with all sorts of crazy details hidden in his arsenal. And I have to hand it to Dan Slott, he did give Norman some kind of master back-up plan, like I was hoping for. It wasn’t huge, but at least it was there. As a grand finale, this issue is excellent. It’s beyond cool. Dan Slott pulls out all the stops and throws in the kitchen sink while he’s at it. And his art team keeps up with ease. Everyone should be proud to go out on such a high note. But I have nitpicks that keep this issue from being truly stellar. These hang-ups might just be mine, so take them with a grain of salt. The biggest problem with this issue is that it’s all been done before, lessening the impact. Norman makes a couple cracks about Gwen Stacey, like always. There’s even a moment where a Goblin Glider is rocketed into Norman’s chest, and he remarks on it. The callbacks got to be a bit much for me, and I’m a big Spider-Man fan. Then everything comes down to Spider-Man and Norman Osborn duking it out one-on-one…which is exactly how the last Peter/Norman face-off ended the last time Slott wrote about them, which was only a handful of stories ago. Slott doesn’t really come up with anything new to say about Peter fighting Osborn. 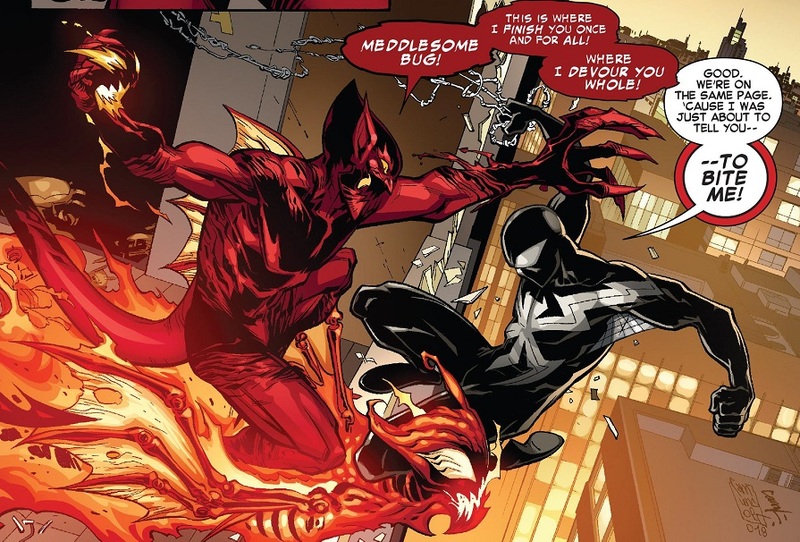 The only new and unique thing about this storyline was the Red Goblin, but Peter only wins by convincing Norman to ditch the symbiote, and not in a particularly clever way. Basically it’s just, “Norman, stop using that thing,” and then “Good idea, Spidey, you’re right!” And then Norman immediately loses. Even though you don’t know who either of these two minor superheroes are, their faces are far more important than proper medical treatment! This issue was also a little too jam-packed for some of the more dramatic moments to land. 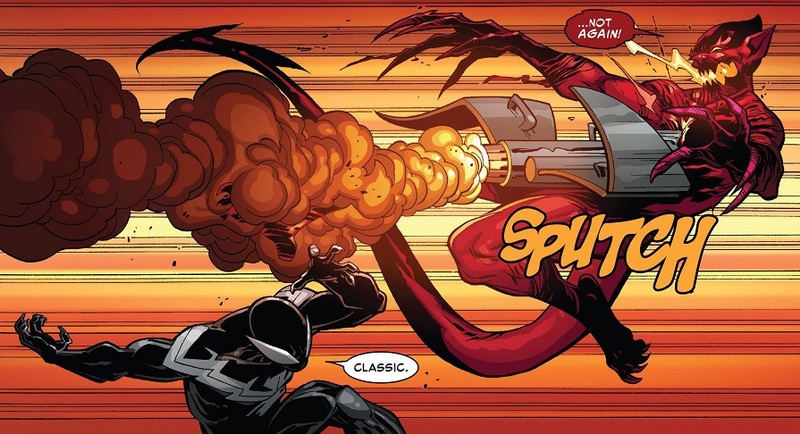 Red Goblin snapping his fingers to kill everybody with the Carnage slivers is immediately followed by a panel of him announcing that it didn’t work, and Flash showing up at exactly that moment to explain it. All the artists did a great job of showing those slivers still in people’s bodies throughout the issue, so the foreshadowing and build-up was great…but then the moment is over in a matter of seconds, and then we’re immediately told it didn’t even matter. Moments like that should have had more time to breathe, but the story and art were too jammed in there. Speaking of ruining dramatic moments, Red Goblin was great at it with his constant stream of wisecracks. I realize that’s the character, and it totally works for the character, but it doesn’t help Slott when he’s trying to sell a big, dramatic emotional moment to have the Red Goblin crack-wise. And they’re not even funny wisecracks, like Spider-Man’s quips. It’s really just the Red Goblin being overly smarmy. Speaking of that finger snap to kill everybody, I’m sure Slott didn’t know how Avengers: Infinity War was going to end, but oh man, talk about stealing someone’s thunder. I’m surprised Slott and Marvel still went ahead with that scene in this issue, but I suppose the comic and art were probably too far along to change it. But as I said, these are all mostly little nitpicks I had with the issue. Overall, it’s a big, fun finale. Slott and Co. should be proud. Can’t wait to read his new stuff. TL;DR: The final issue of Dan Slott’s epic run on Amazing Spider-Man is big, wild and full of punching; a true grand finale. But there are little snags along the way that hold it back. I don’t know yet which of the new Justice League comics I’m going to pick up regularly. I think I’m going to try all three and then decide from there. Normally I’d skip this Justice League Dark comic, but having Man-Bat as a member of the team has me intrigued. 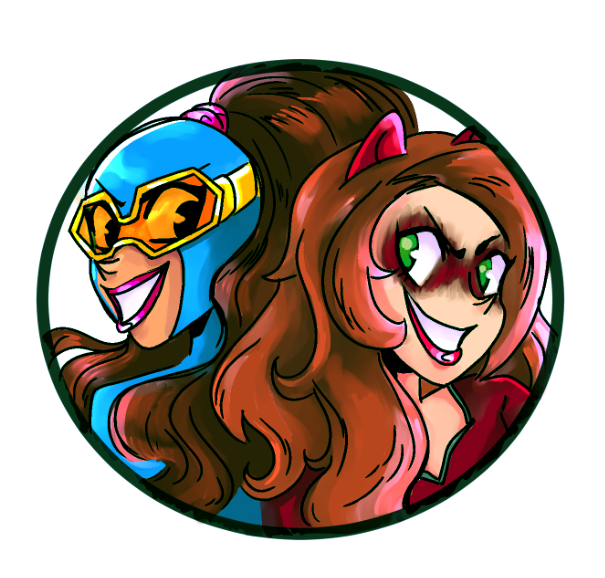 Adding one of my favorite characters to any team lineup is a surefire way to make me pick up a couple issues. With the Omega Titans ready to eat the planet Earth, Vril Dox abandons our heroes and teleports to Earth to speed things along. Cyborg jury-rigs the ship to teleport our heroes and villains back to Earth, where they meet up with Green Arrow, Amanda Waller and the recently arrived Green Lantern Corps. Waller takes some convincing, but she shares everything she stole out of Brainiac’s brain with the Justice League, including Brainiac’s intricate plan for defeating the Four Brothers. The heroes and villains all team up to grow a new seed from the Tree of Entropy, then they supercharge it with the other three Concepts, and then launch the seed into the Brother of Entropy, causing the other three brothers to eat him and disappear! The day is saved! Afterwards, with the Source Wall still broken open and the universe still a dangerous and wild place, everybody starts to go their separated ways, A new Justice League is formed, alongside a Justice League Dark, and a Justice League Odyssey for some other purpose. And Batman forms a secret Outsiders. Justice League: No Justice doesn’t bother to slow down or stop for even a second with its big, crazy, mega-wild story. The Earth is in danger, there’s a big group of heroes and villains who all need to work together to stop it, nobody has time for pleasantries. It’s nuts! And it’s super fun! 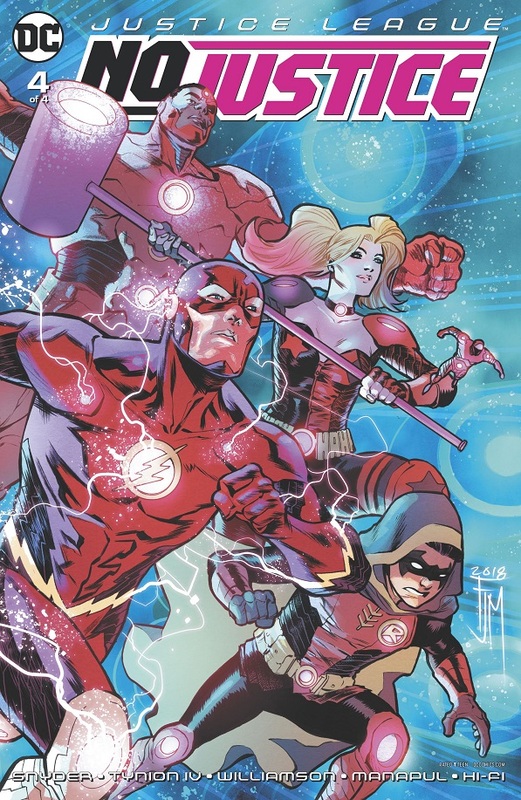 Like the previous issue, I’m slightly disappointed that the stellar/weird character combinations from the first two issues have gone by the wayside (and none of the future Justice League comics seem to promise a continuation), but everything is so wild and crazy that I largely don’t care. There are enough little bits of fun character work here and there to keep me interested, and that’s all I can ask for in a big story like this. The big story itself is more than enough to sustain my enjoyment, and I liked how it all came together, with Amanda Waller’s attack on Brainiac providing the plan to defeat the Four Brothers in the end. Nice wrap up right there. Though I’m not sure what ‘no justice’ is supposed to imply with this comic. Pretty sure this was your standard superhero comic, so it featured the same amount of justice that any superhero comic does. TL;DR: Justice League: No Justice ends as wildly as it began and doesn’t let up for a second! The time has come! 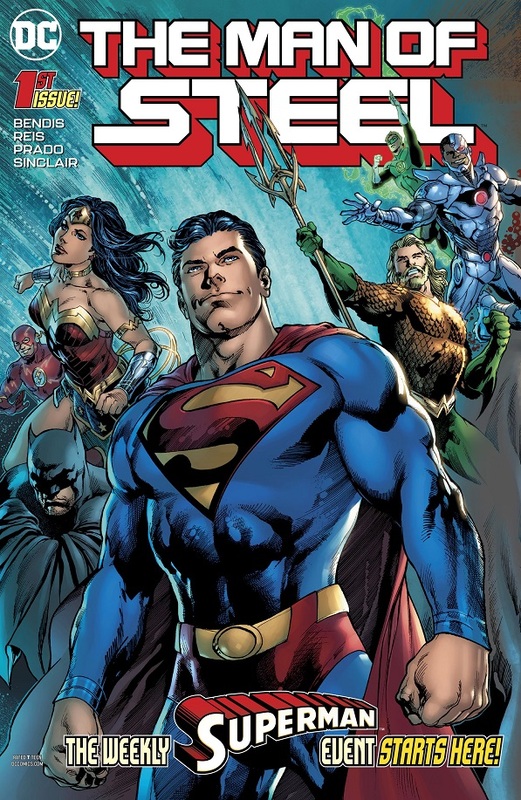 Brian Michael Bendis makes his DC Comics full-issue debut with a new Superman mini-series, leading up to his taking the reigns of both Action Comics and Superman! I’m a big Bendis fan, but don’t read any Superman comics at all, so consider me a perfect test case for whether this whole shebang is any good! On a typical night in Metropolis, Superman busts Firefly and Killer Moth, then helps put out an apartment building fire. While searching the building afterwards, Superman meets newly hired Deputy Fire Chief Melody Moore, who suspects a string of arsons have been hitting Metropolis. Superman tells her to get in touch with his pal Clark Kent at the Daily Planet to take the story public. Later, at the newspaper, after writing the story, Clark is forlorn while looking at a picture of his wife and son. A flashback reveals that something very drastic happened with a bright white light! Meanwhile, in the past, a big, scary-looking space alien named Rogol Zaar speaks to a council of universal elders and proposes that the planet Krypton be destroyed before it starts conquering the galaxy. Also, he’s some kind of space hero, which is why the council is giving him the time of day to begin with. Later on, the council rejects Rogol’s plan, and he’s pretty bummed about that. I’m being very generous with my rating because I can tell there’s a lot more story to tell. This is just a fun, reader-friendly introduction to Superman and whatever story Bendis has planned. We get Superman being heroic all over the place, we get peeks at the Daily Planet and plenty of teases for some big mystery, and we get the introduction of a new supporting character (which I’m pretty sure happens every single time a new writer comes on. Someone should make a list of all the short-lived Superman supporting characters who pop up and then disappear, especially if they’re women with alliterated names, like Melody Moore, or firefighter Lee Lambert from the last time I regularly read a Superman comic three years ago). For somebody who loves Bendis and doesn’t regularly read Superman comics, this was a solid, enjoyable introduction to both. There aren’t any really big or exciting hooks just yet. It’s more of a back-to-basics approach to Superman, with enough mystery to commit to a story happening. My one big complaint is that this new villain, Rogol Zaar, is about as generic as they come. I’m all for creating new villains for heroes to fight, but man oh man, this Rogol fellow is pretty damn boring. He’s just a beefy cosmic alien with a chip on his shoulder and a stupid name. He doesn’t get a cool introduction and he doesn’t really do anything in this issue. He’s just angry at Krypton for moderately explained reasons. Granted, those scenes take place in the past, so maybe he’ll be more interesting in the present. But consider me bored to death already. He’ll probably be strong enough to take on Superman…until he isn’t and the story is over. 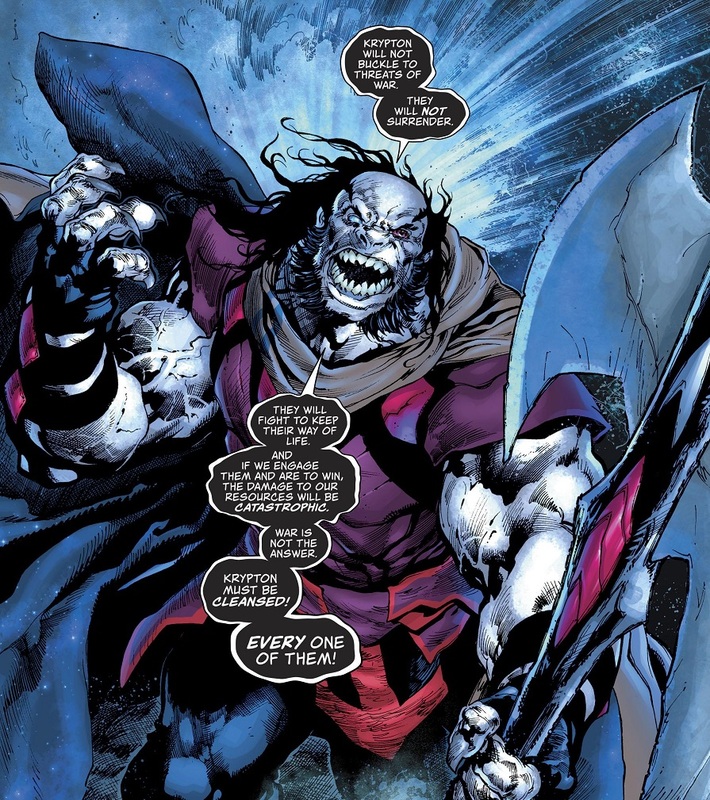 Also, I don’t particularly care that he’s being retconned as the destroyer of Krypton. Personally, I think it’s a dumb retcon. Having a specific individual responsible for Krypton’s destruction, instead of it being caused by Krypton’s own hubris, is just dumb. What does that add to the story of Superman? A bonus level of anger for when Superman punches the guy into defeat? The last thing Superman comics need is a retconned explanation that Superman should have been out for revenge all this time, against our spiffy new villain, no less. C’mon! Care about Rogol Zaar! Our retcon should make you think he’s important! Double also, wasn’t revealing some vaguely generic cosmic bad guy as the source of Krypton’s destruction the entire plot of Superman: Earth One? I think his name was Tyrell. That came out in 2010. I never read the second or third volumes, so that all may have changed. Triple also, I just want to note that it doesn’t bother me that DC wants to retcon a specific villain as responsible for Krypton’s destruction. I think it’s a dumb idea, yes, but I’m not butthurt over how it changes established continuity. Just wanted to get that out there. TL;DR: Brian Michael Bendis’ proper debut on Superman is off to a good, reader-friendly start, though the scary new villain leaves a lot to be desired. Apparently the next issue is the 50th issue of Ms. Marvel! That’s pretty amazing! But it means G. Willow Wilson wraps up her current storyline a little too quickly for my tastes. Zoe fills in her friends about the dangers of the new popular girl, Kaylee, and when Kamala finds out, she confronts the girl as Ms. Marvel. Turns out, Kaylee is a returned Doc.X! He’s created himself a new robot body and inserted himself into Kamala’s life to extract revenge! Which includes hosting a Spring Fling dance at the end of the week! Everybody goes to the dance, but they’re expecting Kaylee to do something evil, so Zoe and her pals interrupt Kaylee’s speech immediately and reveal her intentions to their classmates. Then Ms. Marvel shows up and exposes the robot body to the rest of her class. There’s a fight and Ms. Marvel and Red Dagger easily take out Doc.X. Meanwhile, Bruno and Mike patch things up, Kwezi decides to go back to Wakanda, Zoe and Naftali’s sister Alanna start making googly eyes at each other and Red Dagger decides to go back to his country, too, leaving things open for Kamala and Bruno to try and make a go of it. Honestly, I’m a little disappointed at how smoothly everything wraps up in this issue. Like, for a moment, it seemed Wilson was really going to twist the knife with everything she’d set up. She had Doc.X infiltrating Kamala’s school, all while knowing her secret identity and holding that over Kamala’s head. She had a great love square going on with Kamala, Bruno, Mike and Red Dagger. She introduced a school dance, always a great opportunity for good high school drama. But everything is closed off nicely by the end of the issue. Doc.X’s threats never materialize and he’s soundly exposed and defeated with nary a concern. Red Dagger simply goes away, solving Kamala’s relationship drama for her. Mike and Bruno easily bury the hatchet. And Kamala and Bruno are simply thrust back together no biggie like. Even Zoe’s relationship woes are solved quite effortlessly. None of that is to say this wasn’t still a super fun issue of Ms. Marvel. Doc.X is great as a reoccurring bad guy. Kamala needs her own Rogues Gallery, and he’s a fine Ultron-Lite addition. I really believed the danger he posed and Kamala’s fear. 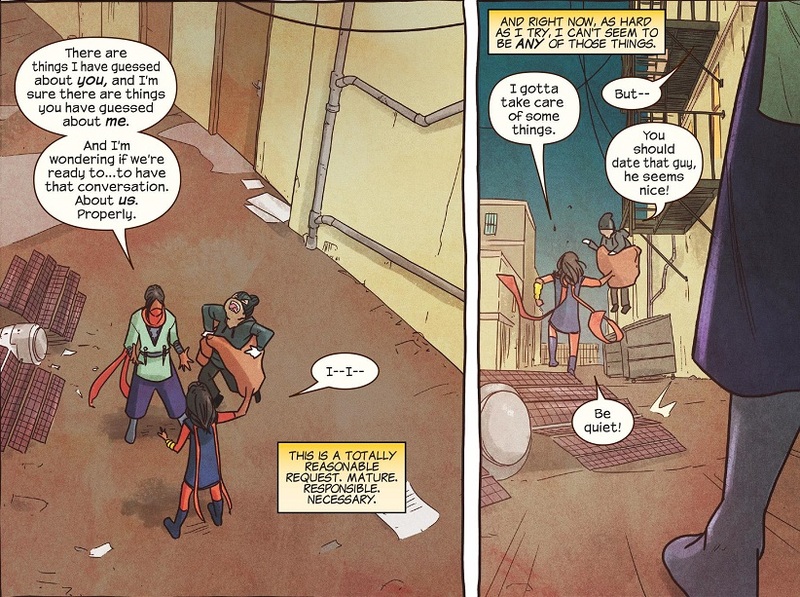 I love almost all of Kamala’s supporting cast, so seeing them tackle Kaylee on their own is a hoot and a half — though I still think it’s getting weirder and weirder that none of these people are putting it together that Kamala is Ms. Marvel. Is this what reading superhero comics in the 60s was like, when secret identities were a bigger deal? I feel like Lois Lane from all those classic, sexist Lois Lane/Superman comics, always desperate to prove that Clark Kent was Superman. 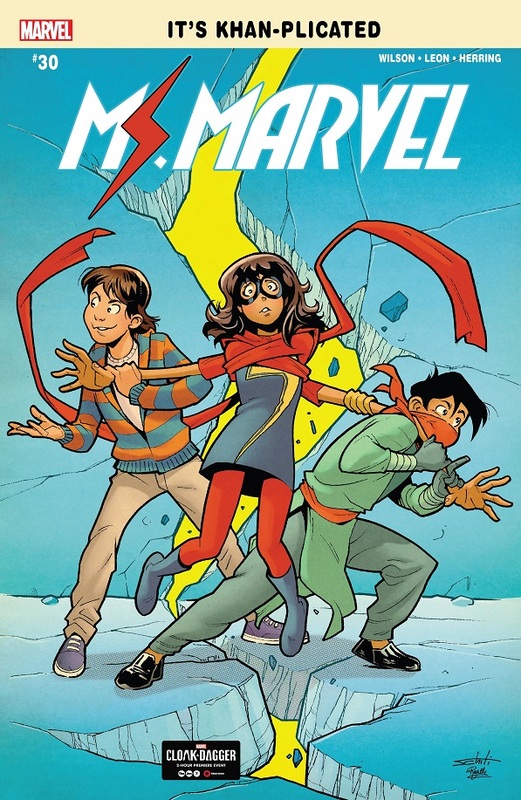 But I digress…everything worked well together to produce another stellar issue of Ms. Marvel’s high school superhero drama! TL;DR: Despite everything wrapping up a bit too quickly and a bit too neatly for my tastes, this was still a super fun issue of one of the super funnest comics on the stands. Posted on June 2, 2018, in Comics, DC, Marvel, Reviews, Spider-Man, Superman and tagged Agent Anti-Venom, Amazing Spider-Man, Flash Thompson, Green Goblin, Justice League, Justice League: No Justice, Kamala Khan, Man of Steel, Ms. Marvel, Red Goblin. Bookmark the permalink. 2 Comments. Ms. Marvel was great. Zoe has a girlfriend now! Good for her! I’m a little disappointed to see Red Dagger leave. He was nice. Right? Granted, I don’t remember why he came to America…but still, just sending him home an issue after his big first kiss with Kamala seems like just sweeping him under the rug!